Popular TV show the Walking Dead has zombies that attack living survivors relentlessly. The modern company may face the same fate with its traditional desktop infrastructure, as Internet attackers seek for gaps and vulnerabilities with end-of-life systems and unpatched software. The WannaCry ransomware attack of 2017 proved that even big brands are vulnerable, and companies everywhere rushed to update their systems. Why are traditional desktop infrastructures so at risk? They’re vast, encompassing thousands to millions of devices that are expensive to upgrade and require change management initiatives to redeploy. They’re aging, because technology refreshes at such a vast rate, and the user experience is moving away from the device to the interface, which is typically the cloud. They deliver an inferior user experience, because functionality and features lags SaaS apps employees can buy themselves. And they do: The average enterprise uses 1,200 cloud services, and 98% of them are shadow IT. And they’re vulnerable, because companies sunset support on end-of-life systems and patches must be implemented by hard-working IT teams that are often busy on other projects. So how can a Modern Desktop from Microsoft help you improve security? First, cloud services are now seen as more secure than on-premise infrastructures, due to their strong governance, constant updates, ongoing vulnerability testing, strong disaster recovery processes, and “compliant by design” nature. It just makes sense that a global enterprise like Microsoft has more resources to constantly enhance the security of its market-leading solutions than enterprises, which typically have talented IT teams who do it all. That’s why Gartner says that public IaaS workloads will suffer at least 60% fewer security incidents than those in traditional data centers. 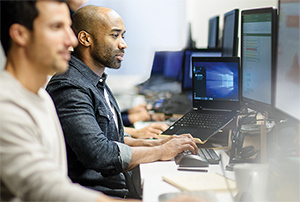 When you team with a Microsoft partner to buy Microsoft’s Modern Desktop services, you are getting managed services, including application updates, patches, monitoring, and security. As digital pressures grow, more companies are turning to managed service providers (MSPs) for Infrastructure as a Service (IaaS) and Platform as a Service (PaaS) offerings, so they can focus on core business needs. That’s why half of all organizations surveyed by 451 Research said that they consider MSPs to be essential to the success of their digital transformation projects. Here’s how the Modern Desktop addresses your security issues. First, all Microsoft solutions are built on Azure, the trusted cloud. Azure meets international, country-specific, and industry-specific regulatory compliance standards, such as the General Data Protection Regulation (GDPR), ISO 27001, HIPAA, FedRAMP, SOC 1, and SOC 2. What this means is your employees can use Microsoft’s Modern Desktop in every geography, location, and industry, knowing they are compliant with key requirements. Microsoft 365 includes built-in and continuously updated capabilities that help companies meet industry regulations that govern archiving, retention, disposition, and discovery of data and reduce the complexity of executing compliance workflows. The Microsoft 365 Security & Compliance Center is integrated with Azure Active Directory, Microsoft Exchange, SharePoint, and Teams. Excessive access privileges allow individuals to circumvent controls and access data and apps they shouldn’t. “Toxic combinations” can occur when privileged users combine multiple levels of access to gain unprecedented control. In financial services, this has often meant excessive risk-taking. It technology, it can mean opening the gates of the kingdom, including valuable IP, competitive data, and strategies, to malicious insiders and their external partners. Microsoft protects against excessive access privileges with integrated identity management, that centralizes identity and access management across devices, data, apps, and infrastructure. That means your employees each have just one single user identity as they authenticate and gain access to key resources, like Office ProPlus and SharePoint. Similarly, role-based access control enables you to grant “least privilege” – providing only the access individual users need to do their job. Microsoft solutions provide multiple levels of security, including password policy enforcement, which forces users to create secure passwords that expire and locking them out after too many failed log-in attempts. They also use multi-factor authentication, which securely identifies users, without disrupting their experience. Microsoft Authenticator requires users to use multiple methods to access the Modern Desktop, such as a password and an SMS code, token, wearables, or biometrics. Token-based authentication, which is more secure than SMB, is enabled via Active Directory Federation Services or third-party systems. Finally, the Microsoft Modern Desktop helps you enforce data loss protection (DLP) policies. With a DLP, which is part of the Office 365 Security & Compliance Center, you can identify the sensitive information that is stored in Microsoft solutions online and in desktop versions, prevent accidental sharing of information, help users stay compliant, and view policy compliance in reports. With the Microsoft Modern Desktop, business leaders and IT can rest assured that they are empowering workforces to do their best work, while reducing security risks, due to aging and unpatched systems, poor controls, or user mistakes or malicious behavior. With data breaches costing millions of dollars in revenue loss, fines, and customer trust, it pays to secure the enterprise proactively.